The new origin story of how one of Marvels and Americas greatest heros were created and motivated. Finally a really good Super Hero movie! Please note: I have not read the comics, so my review might not be fully valid. We have seen quite a few Super Hero movies lately, and most of them have not been that good, to be honest. But this one is actually really good for a change! 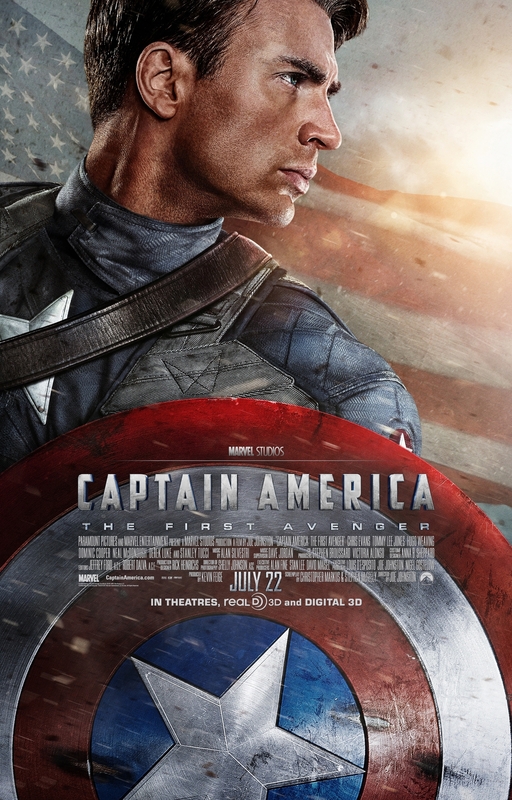 I did not know that much about Captain America, but this movie is sort of a origins story about him, and it gave me a good introduction to him and how he became a super hero. The plot is classics super hero action: boy has problems, boy gets super powers, world meets super villain, boy goes after super villain while super villain tries to end the world as we know it. It is simple and classic and it works! The acting is good. Chris Evans does a good job playing a smaller version of himself and also when be becomes Captain America. He should be no stranger to playing a super hero, as he previously has stared as Johnny Storm in the two Fantastic Four movies. Hugo Weaving playing Red Scull / Johann Schmidt will always be Agent Smith from The Matrix for me (even when playing King Elrod in LotR), so it is funny, that he is actually named Schmidt in this movie. He does a great job though. Stanley Tucci always does a good job, and I was quite impressed on how well he did the German accent. The effects of this movie are great, but maybe a bit over the top. It is fun to see the "futuristic" WWII equipment, but maybe they should have toned the weapons down just a bit. Compared to many of the other super hero movies we have seen recently, I like the attention that has been made to the details in this one. There are far less sloppy or lame explanations here, than in the some of the others, and this puts it in a higher league. I also still love that Stan Lee shows up as some random extra in these movies. It is a nice and funny touch. If you are new to super hero movies or the Marvel universe, this is a good place to start. It has a lot of action, so if you are into any kind of action movie, this is also recommendable. Watch this with friends - it is a good one to share. Marvel is really getting somewhere with their movies these days. This felt like a true origin movie, well worth it's hero an villain. They greased the plot in a few spot to make it "believable" in regards to the line of new movies leading up to The Avengers(2012), but that all made good sense. I liked the fact that it didn't feature too much slap stick(not nearly as much as Iron Man and Thor for instance), but of course it had it fair share. One could think that a movie featuring a captain of the USA, would be all hail the US, but in fact it came out quit a bit sceptic towards some of the efforts taken to drive the war, such as drafting and the trade of war bonds, but not at all a focus of the movie. The main focus was the creation of two super humans: Red Skull and Captain America. I found the technology of Red Skull to be a bit too futuristic, but mostly the visual representation, not so much the practical usage. I mean the whole "very-bright-laser'ish"-look has been used a bit much. The movie focuses mainly on character development. This might be the reason it has come out so well. Instead of just head on action. If you're not too fed up with superhero movie at this point and like where the whole Hulk + Thor + Iron Man + S.H.I.E.L.D = The Avengers are leading, you should look forward to seeing this one. P.s. I saw it in 2D, since I still don't get 3D, and I did not feel like I missed out on anything.